Today was another busy day in Beijing. The weather was a bit warmer today but still pretty cold. I wore my running pants under my jeans and about 3 layers on top. We started out at 8:30 and headed to a jade factory. After the jade factory, we went to the Great Wall. All I can say is Wow! What an experience. Scott went up pretty much as far as he could go. I walked up a short stretch and then watched him from below. So….all the pictures at the Wall were taken by him. Pretty amazing (the wall and his pictures). The pictures are a bit foggy because there was a lot of smog in the air today. After lunch we went to the Olympic village and walked around for a while. 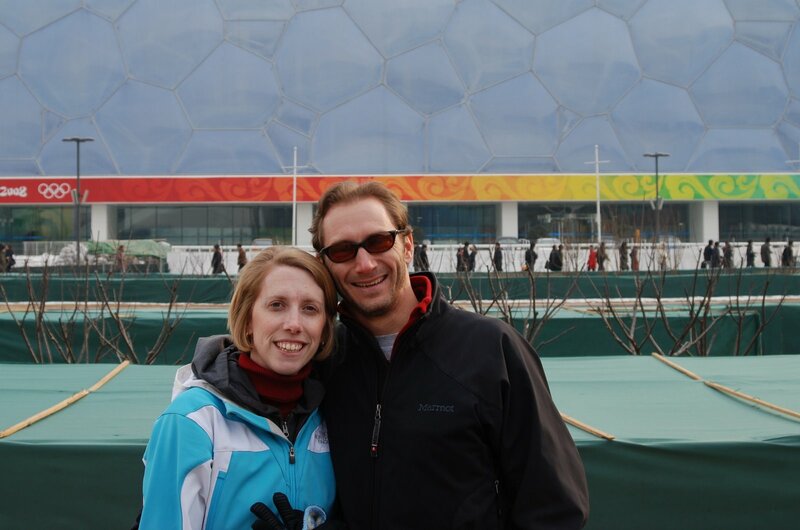 The Olympic village was really fun to see and we got to view the Birds Nest and Water Cube up close and personal. Finally, we ended the day with a Chinese Acrobatic Show. That was so cool and the kids would have loved it! Tonight, we decided to forgo dinner and eat an Odwalla bar in the room. We are wiped! Scott is asleep on the bed as I write. The Great Wall. Very cool. You sound busy…aren’t you supposed to be resting up? 😉 Grace wants you to know that Sam was on Chipeta TV AND the Soaring Eagle wall in the same day.